Greetings everyone and welcome to our new, slightly renewed version of the JJnet website! We have been doing many improvements/changes to the existing site features, such as the rules, articles, match submission/verification, etc. as well as a couple of new features, like the new clan vetoes system available via Team Management. Please look around at the new features and let us know if you find any errors or something that doesn't seem right. §6.2.2 In order to let clans prepare for this, the clans have to announce their new veto level(s) during the invitation phase to the final matches. Should a clan decline their invitation, the invitation phase will extend as a new clan is invited and the clans whose expected opponents change may still change their veto levels until the new deadline. This rule was changed to prevent clans from delaying with their map vetos until just one day before the CW. §3 In the standard case, in which two maps are played, both teams choose one map each before the game starts. The challenging team announces their map choice first by default, unless agreed otherwise. $3.1 The challenged team has the right to choose the map order. This rule was changed so that the challenged clan would no longer have such a big advantage in normal matches with the ability to choose a map based on the result of the first round, after it has been played. This should also optimize the time spent on map picking, since both clans need to choose their maps simultaneously. However, the challenging clan is expected to still announce their map first and the challenged clan may choose the map order, if they want to. With that said, we wish you all good luck! Addition of the maps: Frontier Falls, BloodBunny's Lair (JJnet), Facing Worlds, Starlit CTF, Medieval Skyscrapers and Carrot Farm. Removal of the maps: Butrinti, The Astrolabe, Distopia and Orbital IV. The following maps are now 3v3+ only: Daybreak, Galactic Warfare and Jungle’s Edge. The mappool is now set ready for the next season. You can view it here. However, Carrot Farm has been requested for optimization in graphics, due to the lower FPS rates in that level, which might cause issues for players playing on slower PCs. For now use the current version. Thanks to every clan for voting! The mappool should now be more democratically formed than ever! What are your thoughts? We agree on the change to make gw, olcjunge and ezdaybreak 3v3 only. and we agree on JE and Daybreak (if this stays in) being 3v3, but we don't approve on GW being 3v3. Jungle’s Edge, Galactic Warfare, Daybreak. In the case of JE and Daybreak, it’s due to them being picked specifically for stall purposes and being a bit too hidey (i.e under bases for JE and the whole level for daybreak) for the purposes of actually closing kills in 2v2. In the case of GW, it’s due to there being a very limited level of gameplay in 2v2s and some areas just allow too much campiness and rushiness specifically in 2v2s, fine for 3v3s tho. The maps that received 2 or more votes have been now added/removed from the mappool. However, due to the wide spread of the rest of the votes, all maps that received only 1 vote are given a second chance. Meaning that the same clans as previously are allowed to vote for each map they would like to see added/removed only from the levels above that received only 1 vote. 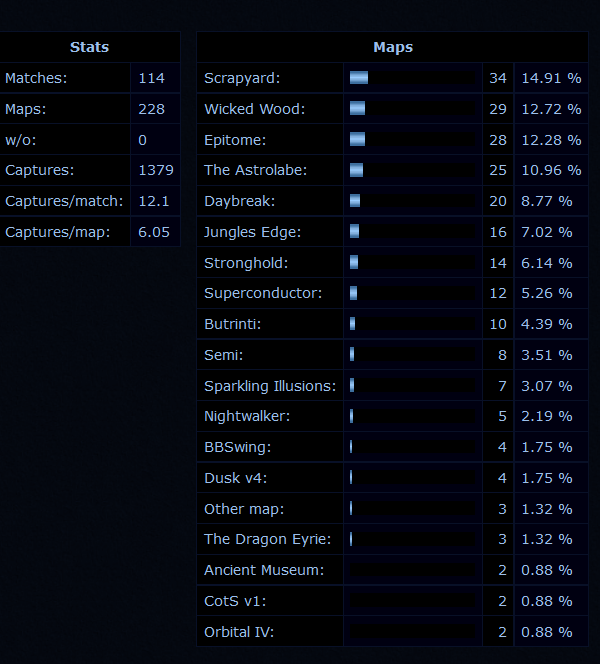 Each clan may vote for as many maps as they like, and simply mentioning the map names is enough, e.g. "We vote for ADD: Unconventional coffee and Price of Admission. We vote for remove: Butrinti, Distopia and Daybreak." There are no negative votes. Each clan (except CX) are also requested to report whether they agree with the changes requested by CX, e.g. one by one: "We agree with the changes to JE and Daybreak". Note that a map may be rejected from the mappool if it does not meet the general quality standards, despite having received enough votes. the latest (and I will in turn announce my clan's votes to one of you as a proof of our votes). We want to make the following maps 3v3 only: Jungle’s Edge, Galactic Warfare, Daybreak. In the case of JE and Daybreak, it’s due to them being picked specifically for stall purposes and being a bit too hidey (i.e under bases for JE and the whole level for daybreak) for the purposes of actually closing kills in 2v2. In the case of GW, it’s due to there being a very limited level of gameplay in 2v2s and some areas just allow too much campiness and rushiness specifically in 2v2s, fine for 3v3s tho. The mappool is changing once again for the new season, that's no surprise. However, this time we let clans have more voice over the mappool changes again. We strive to make a mappool that would be as balanced as possible, having around 18-22 maps altogether, from which at least 50% should be pickable in 2v2 matches. Now, each clan that played any ladder matches (no victories required) during the past season (13) are eligible to vote for up to 3 maps to add into the mappool and 3 maps to remove from the mappool. You may vote on any officially released map for additions, even the previously included ones, except for DW and Fauztinville due to them having been picked by no one just recently. You may, however, vote out Distopia/GW/Gauntlet, since they were expected to return at the end of the past season anyway. Each of these clans are also eligible to request changes to the categories of the current maps in the mappool, to make a map 3v3+ only or vice versa, but these have to be motivated with a reason, e.g. "This map should go to 3v3+ only because it is too complex for 2v2". Like previously, we do not decide beforehand how many votes are required for a map to be added or removed, as we try to keep the mappool balanced, but we promise to treat maps with equal amount of votes the same way. Also, each vote of each clan weighs the same, so there are no 0.5 or 0.25 factored votes. Clan leaders (or delegates approved by the clan leaders) please send me your clan's votes by February 24th at 22:00 GMT the latest (and I will in turn announce my clan's votes to one of you as a proof of our votes). The 13th season of the JJnet ladder season has come to its conclusion only after approximately 5,5 months since its beginning, which is way faster compared to the previous season. 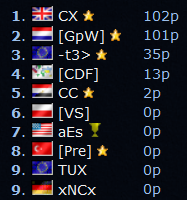 Congratulations to CX for their third season victory in a row and honor goes to the GpW as well for putting up one of the most tense and exciting final match against CX in the ladder's history. CX won in the end by only 1 score, making the decisive score during the last 30 seconds of the game. ...and refer to the rules. Who will be the star of this ladder season? Good luck to you all! More JJ2 news available over at Jazz2Online.com. More JDC news available over at JDC.